The President's Medallion was worn by the Very Reverend President for the first time during the commencement exercises of Spring, 1966 at the University of Dayton. There is an inscription on the medallion taken from Deuteronomy 33:8, and is descriptive of the qualities of the University's highest officer: "The touchstones of Wisdom and Truth are for the man thou hast set apart." The black symbols decorating the text and suggestive of Hebrew script represent the Wisdom of the Old Testament. The Cross represents the Truth of the New Testament. It is the role of the University to combine both Testaments into a unified whole, symbolized by the circular design. The splendor of such a concept is portrayed by the serrated edge. On the reverse side of the Medallion is a representation of the Madonna and Child, the Word of God become flesh, Eternal Wisdom become incarnate, a lofty ideal of the University's function to incarnate Knowledge in man. The Medallion is made of enameled copper, two processes having been employed in its composition; an etching process known as "champleve" and a silver-wire separation process called "cloisonne." Any exposed copper has been gold-plated. 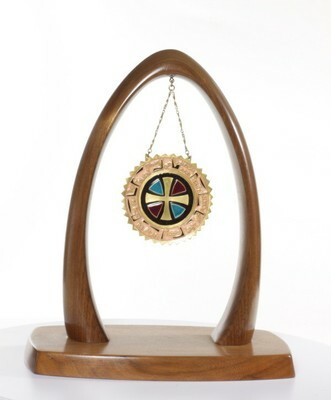 A hand-crafted wooden arch supports the medallion.